Apply 1ml (using enclosed applicator) to the total affected area of the scalp, twice, daily. You should make sure that you carefully read all product packaging and labels prior to use. 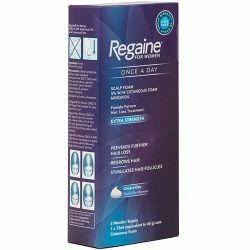 The active ingredient in 1ml of Regaine for Women regular strength is Minoxidil 20mg. Other ingredients are: Ethanol (Alcohol), Propylene Glycol and Water. Don't know why you're losing hair. Have any condition that affects your scalp including sunburn and psoriasis or if you use other creams, ointments, lotions etc. 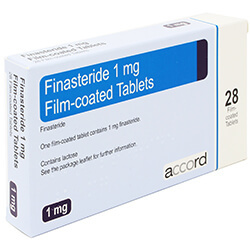 used to treat scalp conditions, e.g. dithranol, tretinoin, corticosteroids (steroids) and petrolatum products (soft paraffin) or have any kind of dressing or bandage on your scalp. Have had sudden, unexpected hair loss which may be linked to thyroid or other medical problems. Have total baldness or complete loss of all body hair. 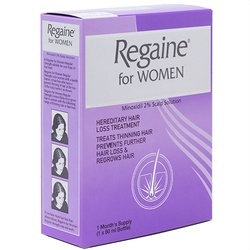 Regaine For Women Regular Strength must only be used on the scalp. Do not use Regaine For Women Regular Strength on other parts of the body.